Hope you are enjoying your weekend. On my last post I promised to share a card that featured the Grapefruit Grove Foil paper that is in the Sale-A-Bration catalog… well, today is the day, and you will not be disappointed. 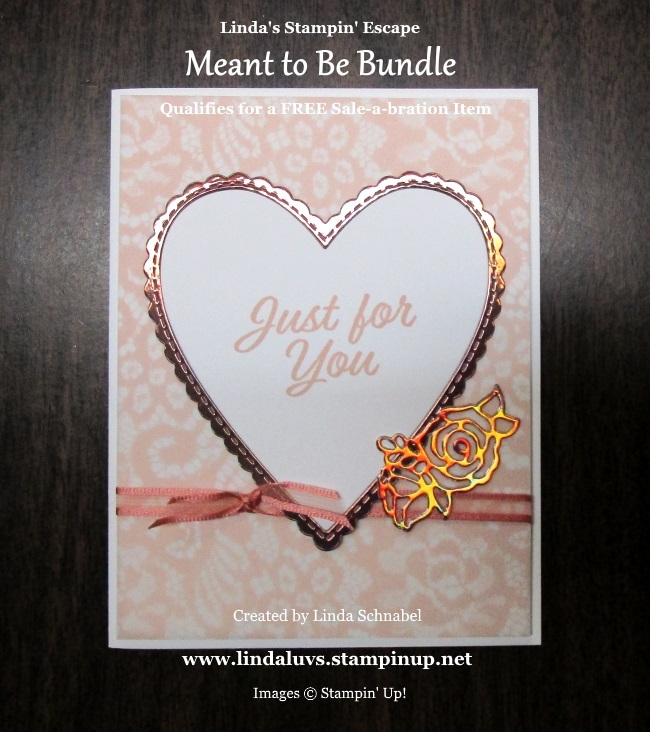 It also features the Meant to Be Bundle and I’m introducing the beautiful Floral Romance Specialty Designer paper. The beautiful background is the Floral Romance Designer paper … but this pattern is actually “vellum” and oh so pretty! This lacy background works perfectly with our hearts. Today I’m using the largest of the heart, and like yesterdays die … this one also cuts 2 heart – the plain heart, and the thin outer heart with the scalloped edge. To get this layering, I actually ran the die through with Whisper White (creating two hearts) and then the Grapefruit Grove Foil sheets. You can actually create another heart layout with the White lace edge around the graperfruit heart. However … today the white is the center so we could stamp our greeting. The greeting is stamped in Petal Pink, which coordinates with the Floral Romance paper. The Grapefruit Grove Foil sheet has an amazing prism of color that runs through it, so it complimented the Petal Pink that I used. I also used the sweet floral die in the set as an added touch to my card, and I thought it works beautifully with our vellum Floral Romance Designer Specialty paper. 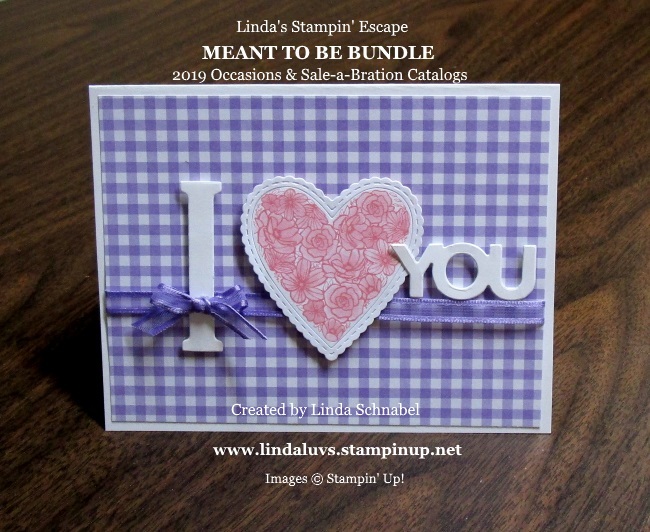 The Grapefruit Grove Ribbon can also be found in our Sale-A-Bration catalog and you can get it, or the foil paper for FREE when you purchase this bundle or any purchase of $50 before shipping & handling. However you hold that card and the light reflects on the Grapefruit Grove Foil paper … you will fall in love with it, just like I did!! I guess it was “meant to be”. Thank you so much for sharing a part of your day with me, it is appreciated. Today is the last day of 2018 and many of us are reflecting upon the past year, and looking ahead to the new one. 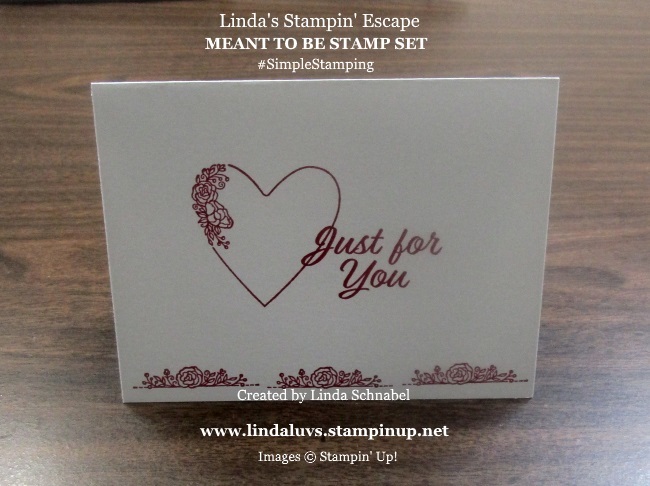 Yesterday I stepped back to the basics of stamping and today I’m just bringing it up a notch plus adding a few stampin’ tips along the way … especially to our new stampers. Now we’re going to create a focal point on our card. 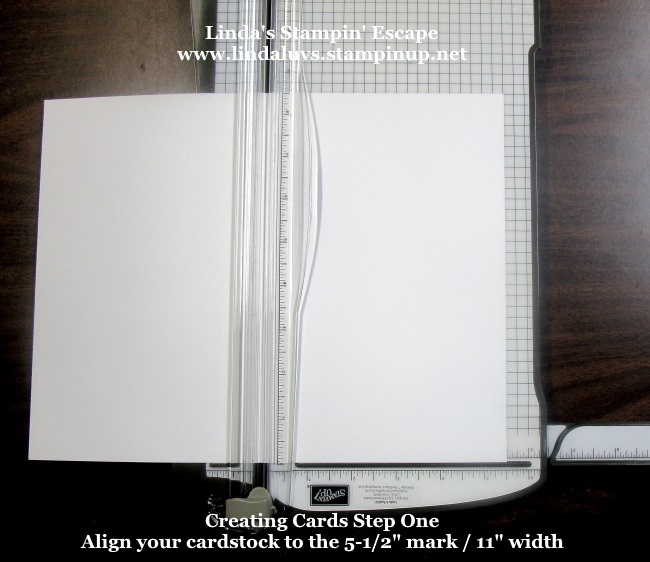 You’ve got your paper cutter so we are going to cut a 2-1/2″ x 3-1/2″ piece of Whisper White to stamp on. I figured out the dimensions after placing my stamps on the block. 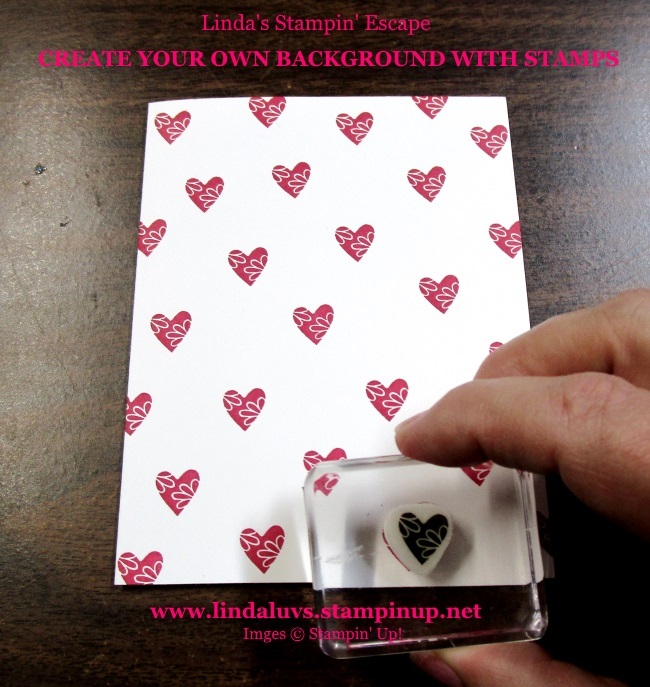 I use my grid paper to align my stamps and determine the size of carstock I need to stamp on. 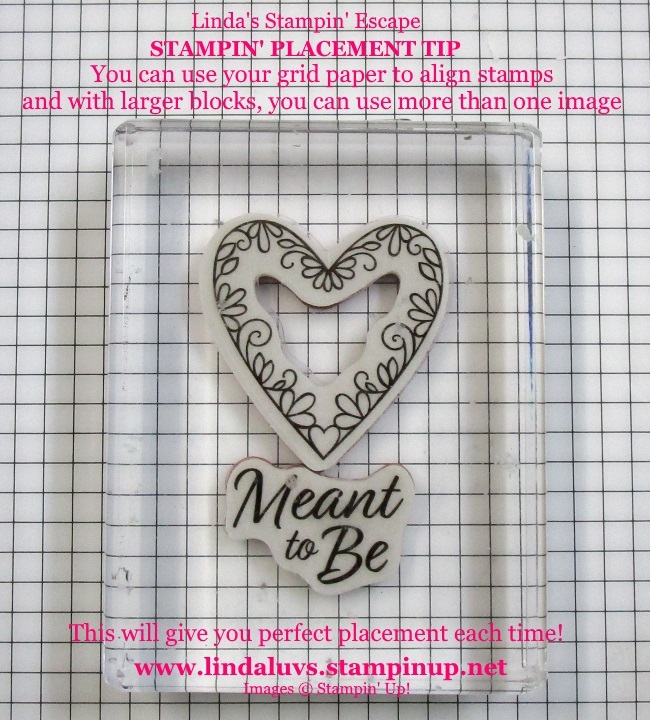 Adding both stamps on one block is a great way to get perfect placement each time you stamp. I do however ink my stamps differently. I flip my block upside down and ink the stamp by tap, tap, tapping the ink pad onto the block … It is much easier to see where and how much ink you are placing on your stamp images! When your ink is applied properly and evenly you will get a sharper, crisper image … and because you can see where you are inking your stamp (and you don’t “PUSH” stamps into the ink) you won’t get that inky mess on your blocks! Now that our “focal point” is stamped, we are going to back (or mat) it with the beautiful Lovely Lipstick Foil Sheet which you can get for FREE with a qualifying purchase during our Sale-A-Bration! To finish off my card and attach the “stamped focal point” … I used our Stampin’ Dimensionals to add some dimension to the card. 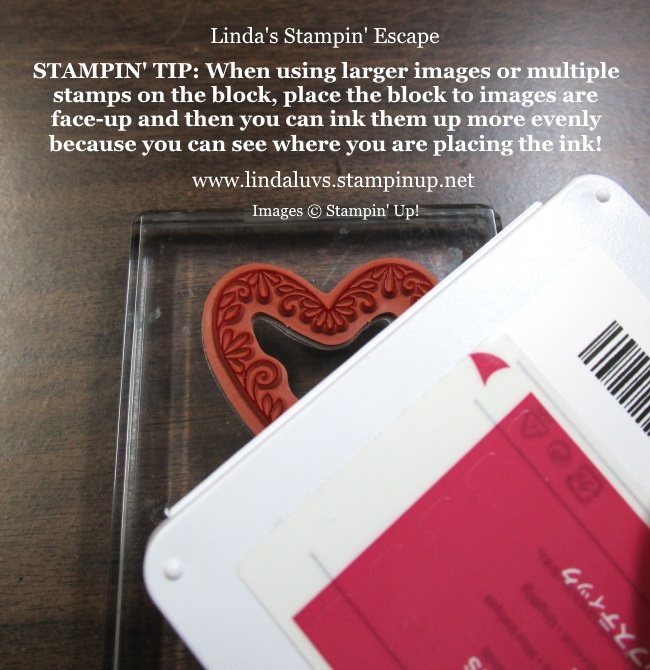 These are a must have in any basic stampers (or advanced stamper) stampin’ tool kit. As I reflect on this past year I don’t think I could have chosen a more fitting greeting; Meant to Be, because being a part of the Stampin’ Up! family was truly “meant to be”. Thank you for joining me today and for being a part of my family of stamping friends ~ Stop back tomorrow as I take it up to the next level of stamping. PS. You are welcome to join my family of Star’s anytime … and during Sale-A-Bration, they are offering an amazing package when you join this journey of stamping, friendship and fun. 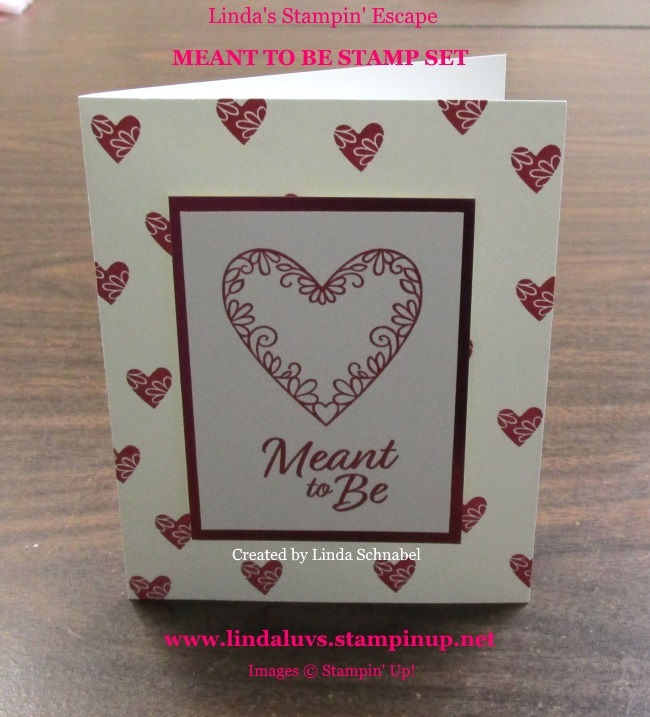 Today’s Stampin’ Supply List: Please note that the “Meant to Be” stamp set is not available until January 3rd. 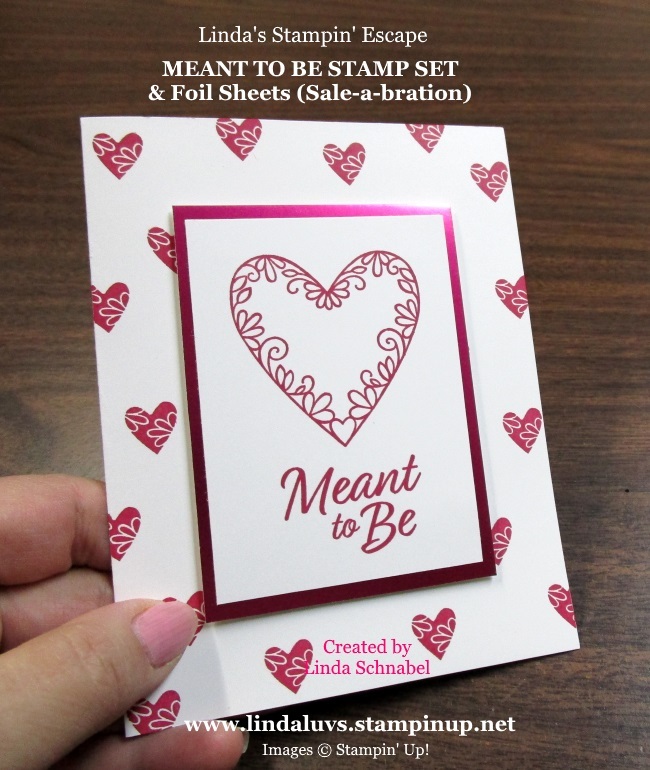 Today I want to share with you another card from the Meant to Be stamp set … but, I will be starting from the beginning. It’s a place we have all been and a place I want to help others begin their journey in the art of stamping. I think that one of the easiest places to begin is with a stamp set you love, and some ink, and paper … if your new to stamping you could use the Note Cards & Envelopes in Whisper White or Very Vanilla. Or you could create your own “card size” bases and purchase the Medium size envelopes – a nice cost savings. Don’t forget a block … I suggest size “D” for the Meant to Be stamp set. You will begin with the 8-1/2″ x 11″ Whisper White cardstock and the Stampin’ Trimmer … this is a must have in any paper crafters stampin’ space. With your cardstock in a horizontal position (the 11″ side) … place it into your trimmer, align it against the raised edge (it is the dark line next to the paper) and the 5-1/2″ mark on the trimmer (right side). Then lay your ruler down and slide the cutting blade (dark slider) down the ruler. Just fold in half and your have a regular size card base!! The light colored slider is for scoring! Now it’s time to stamp! 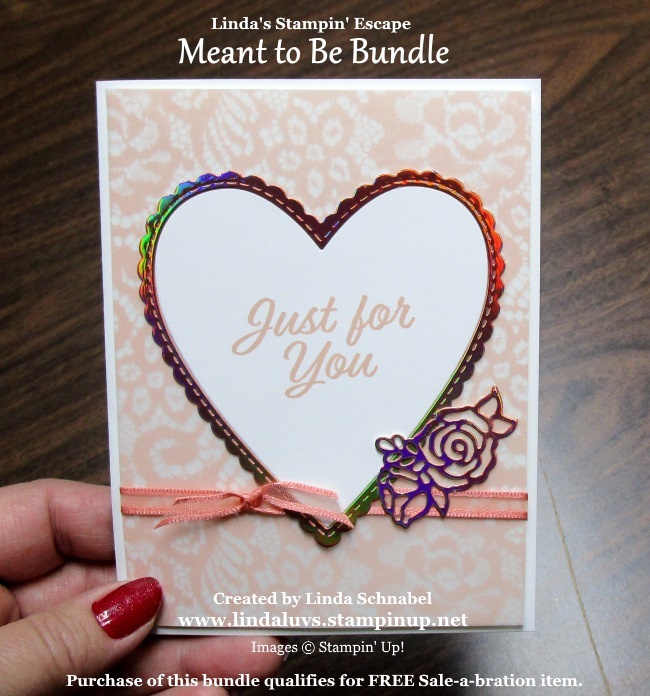 The Meant to Be stamp set is in the NEW Cling backing and will hold “tightly” to your blocks. Once you’ve placed your stamp onto the block … tap, tap, tap into the ink, we’re using Lovely Lipstick! Do not “push” your stamp into the ink pad, the ink is at the top and the pad is softer than the “old style” pads. I began at the bottom and stamped my border first …. I did this so I would have a better placement of my heart and greeting. You will notice that the border coordinates with the heart I used. If you’re lovin’ hearts, there are so many different styles in this set and has coordinating framelits dies. No dies today though because we are focusing on stampers who are just starting out. And what better way than to “Start with Heart”. Stampin’ Up! had a Convention years ago who’s theme was “Starts With Heart” … I truly believe that. 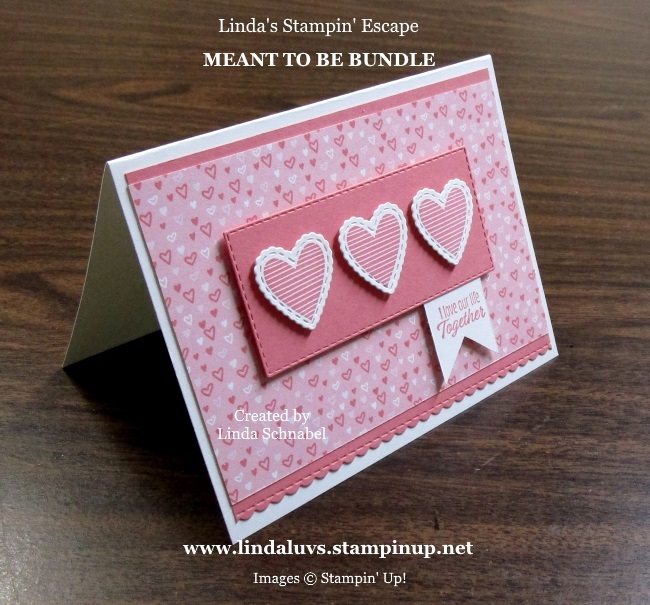 I can’t tell you how many amazing people I have met while on my stampin’ journey … it’s Incredible! Thank you for taking time out of your Sunday to join me today, and make sure you follow along this week as I “step it up” each day!! The transformations will be fun to watch. It’s that time of year… the Retirement List is out! It’s so sad to see some of our favorites leave, but you know there are some great new stamp sets coming! One of my favorite stamp sets retiring it the Ronald McDonald House stamp set … “My Hero”. 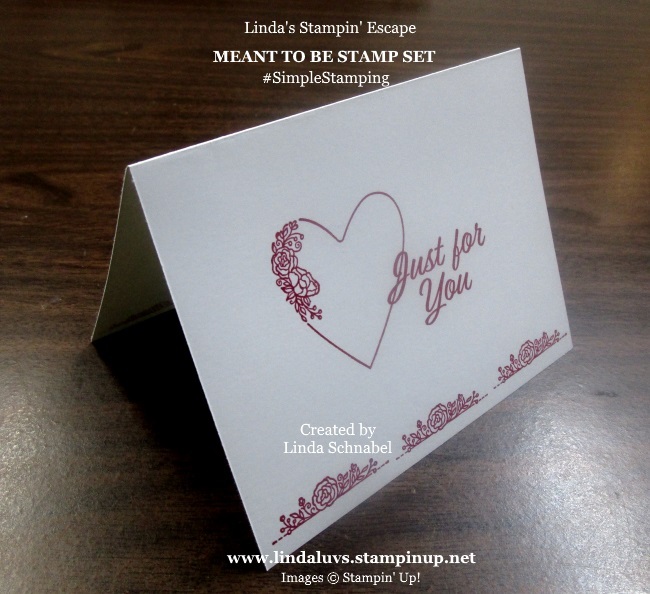 This stamp set touches my heart, because for every stamp set I sell … Stampin’ Up! donates $3 to the Ronald McDonald houses that host families so they can be near their children in the hospital with life threatening illnesses. I can’t image having to go through that, I’ve been very blessed to have healthy kids and grandkid … that’s why it touches me so. This stamp set is so versatile it should be in everyone’s stamp collection!! 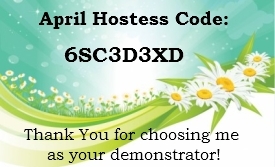 I have 7 card samples for you from this one stamp set! Let’s begin with a card that wishes you well (and the little umbrella ties in with April Showers). 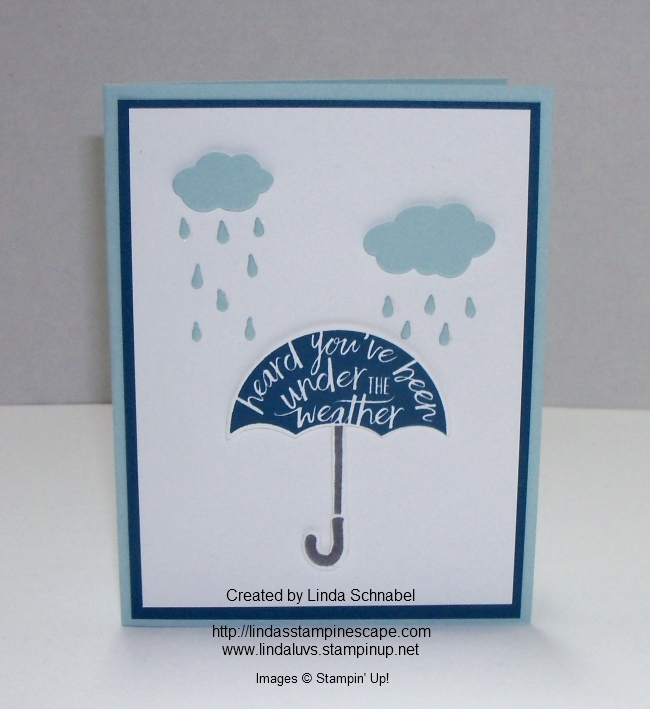 The umbrella in the “My Hero” stamp set coordinates with the Umbrella Weather Framelits on page 193 of our annual catalog. 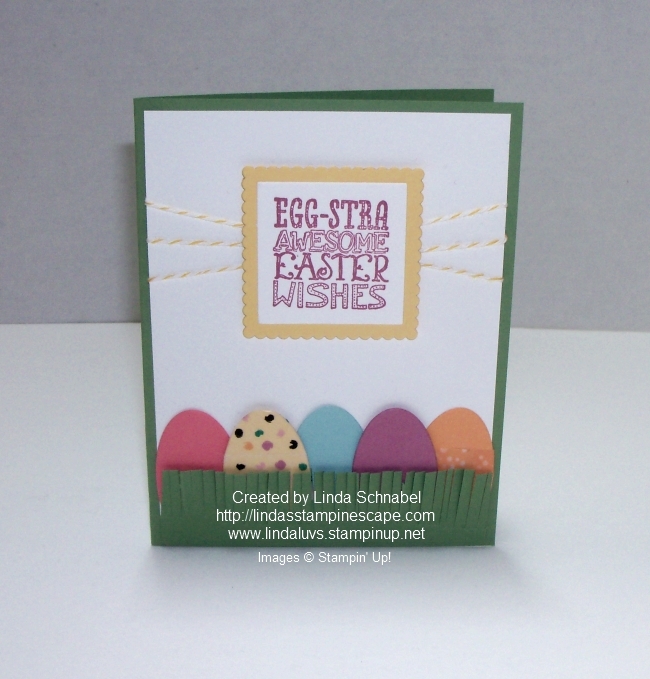 Our next card is easy to make and I used the Layering Ovals Framelits to make my eggs and the Layering Square Framelits for my greeting. Once you have these framelits … you’ll wonder how you ever made cards without them! This is the card that bears the name of our stamp set “My Hero”. Here I pulled out all the punches to create this card. The greeting stamp coordinates with the Best Badge punch and the Banner Triple punch was used for the banners … let’s not forget our stars! Now here’s a fun one … I this card I used the pumpkin face to adorn the lines cut from the “Swirly Scribbles Framelits”. Gently use the end of your scissors to curl the free ends. 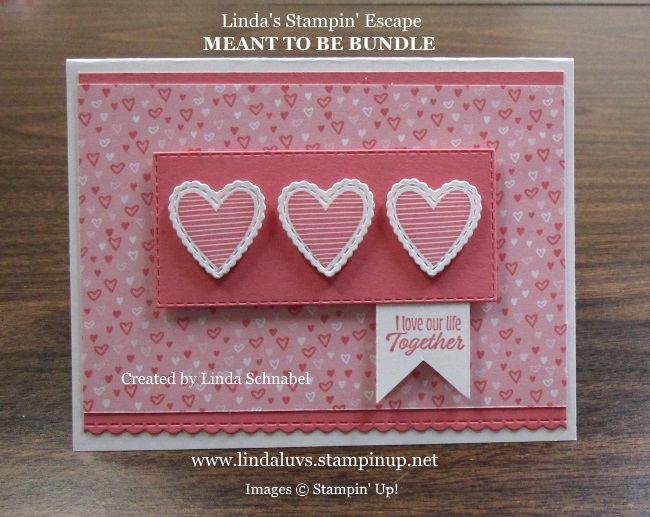 I used the Heart stamp to create this cute little Valentine’s card. The pretty paper comes from the “Pop of Pink Specialty Designer Paper” and the Sweetheart Heart punch. Next, our cute little “Celebrate” card. The designer paper is the “Festive Birthday”. Again I used the Banner punch to create my banners and the band in the center was embossed with the Festive embossing folder to give it some texture and a little jazz! And last but not least is our Christmas card. 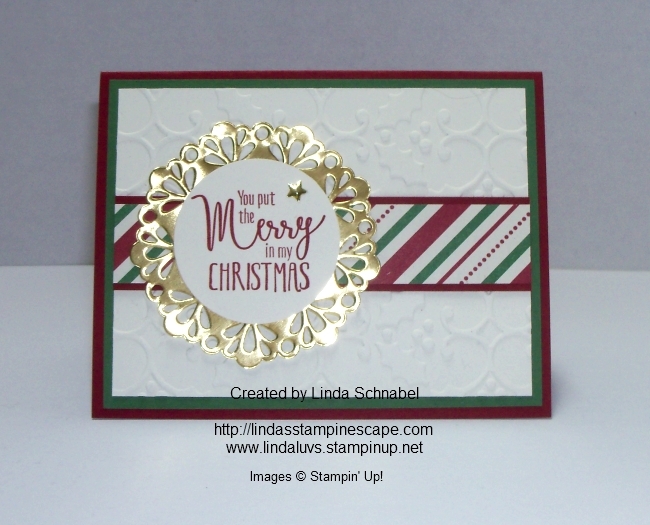 I used the “This Christmas” Specialty paper which is layered over the “Holly” embossed cardstock. Our greeting was punched out and layered over the Metallic Foil Doily and topped off with a Star from the Metallic Enamel Shapes. I wanted to share all of these cards at once so that you could see how versatile this stamp set really is. You can be a HERO, when you purchase the “My Hero” stamp set … $3.00 goes to the Ronald McDonald Houses throughout the US. It’s a easy way to help children fighting for their lives by keeping their families close to them. Let me know if you have any questions or need help ordering this stamp set. Sorry for missing a post, but I got the flu and it really took me out of commission! Feels like I was mugged … my ribs hurt! Anyway … I can finally sit up so I’m going to share a review of some cute cards that feature the Ronald McDonald House stamp set … “My Hero”. 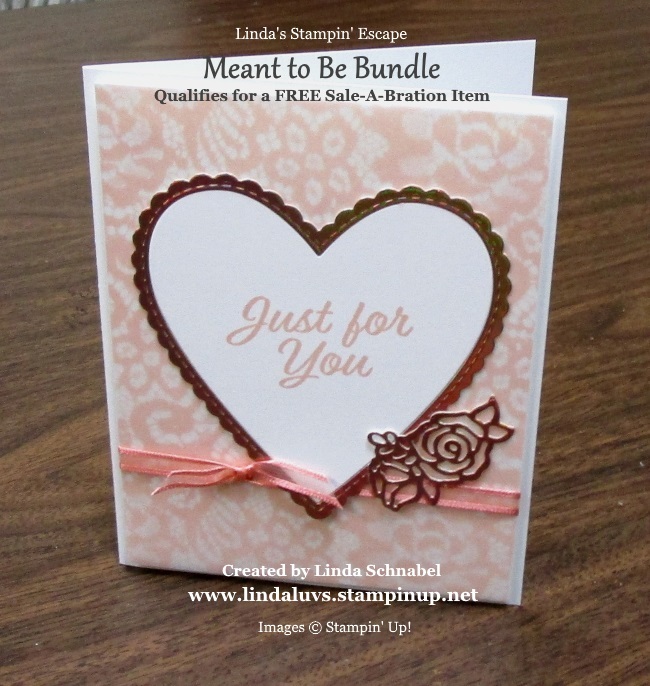 Pair up this stamp set with some of the suggested coordinating products and you can also qualify for a FREE Sale-a-bration item. Let me know if you have any questions.